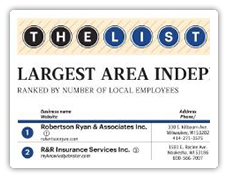 Waukesha, WI - The Milwaukee Business Journal recently released the "2015 List of Top Area Independent Agencies," and R&R is proud to be ranked 2nd. Committed to continued growth, R&R outperforms everyone with the most licensed agents - with a grand total of 148. "We are very proud of our ongoing growth and dedication to serving our clients. Having the most licensed agents in the area is just another way we truly live and breath The Knowledge Brokers," says Dan Wolfgram, Executive Vice President of Personal Lines and Marketing & Communications. Click here to see the complete list by the Milwaukee Business Journal.